AVO Classic SeriesThere are 12 products. 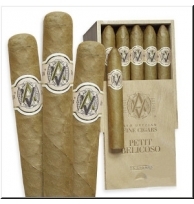 The AVO Classic Series offers a fine flavor and rich aroma that connoisseurs have come to expect of AVO Cigars. Avo's are beauifully constructed from the very finest premium leaves. The AVO No.2 is a classic Toro shape. Rich and creamy tasting. The AVO No.3 is a classic Double Corona format. A classic Grand Corona format. A Corona Extra format in Tubos.